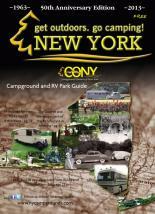 Pittsford, N.Y. - The 2013 Directory of Campgrounds and RV Parks, published annually by Campground Owners of New York (CONY), is now available for free upon request online at http://www.nycampgrounds.com/, or calling toll-free (800) 497-2669. In addition to detailed information about CONY campgrounds and RV parks, readers will find engaging editorials celebrating CONY&apos;s 50th anniversary as a trade association, and previewing milestones for New York&apos;s tourist attractions and events in 2013. The directory also includes an essay exploring the growth and development of the RV lifestyle in America by noted RV historian Al Hasselbart. Hasselbart has led the growth and development of the museum and library at the RV/MH Hall of Fame in Elkhart, Indiana for over 17 years, and has given presentations and appeared in documentaries about RV history both in the US and abroad. 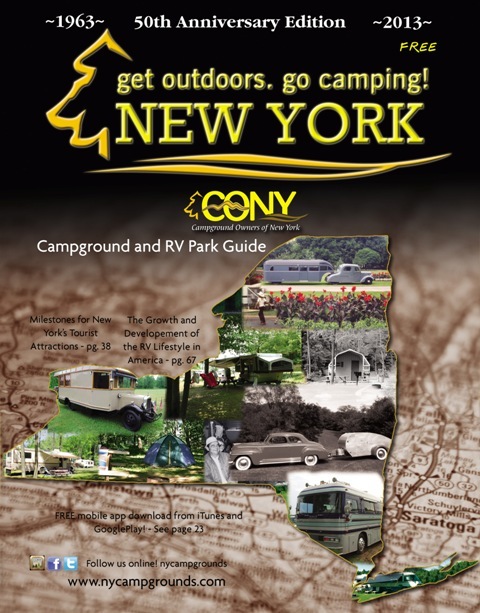 "The CONY directory is a must read for anyone planning a camping or RVing adventure in New York," says Donald G. Bennett, Jr., CONY President and CEO. "CONY campgrounds are among the best in New York State, and the directory has a lot of useful information including park services and amenities, activities and contact information." A digital edition of the directory may also be downloaded for free at http://www.nycampgrounds.com/. Campground Owners of New York (CONY), founded in 1963, is celebrating its 50th anniversary this year! CONY, headquartered in Pittsford, N.Y., is an association dedicated to the promotion, growth, improvement and development of privately owned campgrounds in New York State. More information about the association and its campgrounds - including a free camping directory - is available at www.nycampgrounds.com and www.campcony.com.